Discussion in 'Everything Else InkJet Printer Related' started by MrBird, Feb 7, 2019. I recently picked up an HP Designjet 500. After fiddling and getting the ink supply working, I found that the Cyan and Yellow Printheads were in trouble. Black had many missing nozzles, Magenta was intermittent, Cyan kind of came out purple intermittently and usually I would get no Yellow at all. After several attempts at recovering the print heads I found something that worked. I let it try and recover them multiple times on it's own to no avail. Then I soaked the printheads overnight in a mixture of of ammonia and 70% IPA, this yielded improvement for a short while and then they declined again quickly. After several attempts at soaking them and running color pages through in an attempt to clear the clogs I got frustrated. I ended up folding a paper towel into quarters and placing it in the bottom of a small sauce pan, I then filled with water to a level about a 1/4" up the printheads as they sat standing up on the paper towel. I proceeded to heat the water on the "Warming" burner of my stove to about 180f and let them soak for 1 hour and then repeated with fresh water and paper towel for another hour. I then brought them to the printer still soaking in the hot water, quickly dried them and installed them. The printer passed the alignment on the first pass I then proceeded to print a color bar test page to blast ink through the printheads. Now all nozzles seem to be clear with only some very slight imperfections, and it prints all gradient tests and sweeps with flying colors. I will add some photos of the test pages tomorrow. Hopefully this helps someone, I thought they were done for after attempting the usual remedies I found online, only to have this quickly bring everything back into acceptable working order. WilloBee, PeterBJ and stratman like this. Which one, I prefer the India Pale Ale! Quick update. Yellow wasn't spraying this morning at first, came back on its own quickly but annoying none the less. I suppose today I will pull out the service station and make sure the capping mechanism is working properly. Maybe you guys have some advice. This is a before and after showing what this cleaning technique did for me. Ignore the date and the printing on the backside of the before one. Can't argue with success, though! On this machine the nozzle check is essentially built into the printhead alignment. Each color has its own printhead. It print grids of little squares, It then uses its built in image sensor to scan the grids, if it detects one of the printheads is not producing well it will automatically try and recover the printhead before asking for a new sheet of paper to retry (this is a 42" plotter). If it cant recover them it cancels the alignment and prompts you to replace the printhead that is misfiring/isnt firing, otherwise it goes on to scan all of the squares in the grids and adjust accordingly. I only let them cool down slightly. My theory was as they heated up in the hot tub, thermal expansion would drive ink through the nozzles plates helping free clogs that are softened by the hot water. Then I put them in quickly while still warm, that way when the machine pressurized them during initialization, ink would be drawn in to the printheads as they cooled. then some color bars to blast some clean ink through the nozzles. Is there some particular concern with not letting them cool, that i'm not aware of? Photo for fun, my other half snapped this photo of me getting messing rebuilding the service station. The Hat and MrBird like this. IMO, It does not appear that any colors are "blocked". The brown(?) bar on the left side probably should be in shades of grey, like the top-most stripe. Please post a nozzle check print instead of the "test" print. Its is all of black and 99% of blue that is blocked. I was not sure as it would not run a nozzle check. I managed to get it to run now. I have a major p[problem with this SX600FW as I cant see much about them and certainly not how to remove the cartridge cover without breaking it and also how to remove the printheads as its REALLY blocked badly now. I did not recognize that there were multiple images attached to your post, and "focused" on the first one. 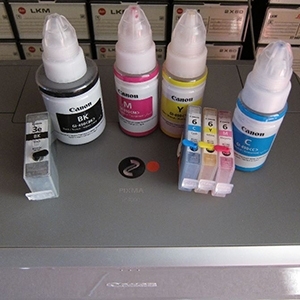 While clogging/blocking can occur on Epsons, this type of issue can also be caused by air-binding (air in the nozzle chambers rather than ink), particularly if the nozzle check "varies" from nozzle check print to nozzle check print. Wait overnight and try another nozzle check print, compare it to an earlier one, and report back.